Three in the Key: A Sonic Boom? This column originally appeared on Creativesports.com. This week there was plenty of NBA free agent frenzy to cover and among the topics discussed were the Sonics possibly leaving Seattle; the proposed deal to send Al Harrington back to Indy and who might be heading to Atlanta; and the Hawks finally finding their man at point guard. Free agent frenzy continues around the NBA and before you know it, the preseason will be upon us. In fact, Monday marks three months until the season opener. For now, however, Three in the Key will concentrate on the latest news and Fantasy implications thereof. Is the End in Sight for Seattle? 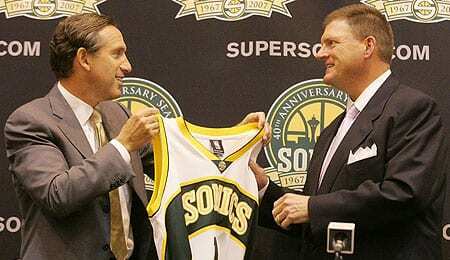 Last week, the Seattle Sonics were sold to an Oklahoma City group led by Clay Bennett, a businessman who helped pave the way for the New Orleans Hornets to play much of their home schedule in Oklahoma City last year in the wake of Hurricane Katrina. Bennett has been saying the right things about the Sonics being an integral part of the Seattle landscape and how he believes the team can be successful in that community for decades to come. But the fact is that the Sonics’ lease for KeyArena expires in four years and when the previous owner could not get public funds to build a new arena (even though the Mariners and Seahawks both got new homes assisted by local government), the writing was on the wall for Seattle’s first professional franchise. Let the countdown begin for the birth of the Oklahoma City Sonics. Harrison Heading to the Hawks? It looks as if Al Harrington, considered the top name in the free agent market, is headed back to the Pacers in a sign-and-trade deal. Golden State was hot and heavy to add Harrington, but the Warriors appear to be resigned to the fact that he’s off the market, even though the deal is not official as of press time. Atlanta will get a nice booty in return for the 26-year-old small/power forward coming off a season when he scored a career-best 18.6 PPG and developed an outside presence. There’s talk that Indy will part with a combination of future draft choices and recently picked draft choices. Young centre David Harrison’s name has also been mentioned. Harrison, a seven footer, turns 24 next month, and like many centres, he’s been slow to develop, although he showed improvements in his rebounding last season. He’s not exactly draft worthy yet, but is a name to keep an eye on given how difficult it can be to find help at that position. While we’re talking about the Hawks, it seems as though they finally got their point guard, even if he wasn’t their first choice. The most glaring need for Atlanta the past couple of seasons has been a floor general, a need exposed even more last season when Tyronn Lue missed a good chunk of time with injury, forcing shooting guard Joe Johnson to spend way too much time handling the ball. The Hawks wisely (how’s that for a non-sequitur?) realized they needed a veteran to run the offense considering they have the youngest team in the entire association. That’s why Atlanta first made a play for Sam Cassell, but when he rejected a two-year, $13-million offer, opting to stay with the Clippers for the exact same money, the Hawks had to look elsewhere. The answer, ironically enough, was Speedy Claxton, signed for four years at $25 million. Why ironic? Well, Claxton has been made redundant in New Orleans because of Rookie of the Year Chris Paul, a player who Atlanta shockingly passed on in the 2005 draft. So now Paul’s backup will run the point in Atlanta. With Claxton aboard, Lue can shift back to his more comfortable back-up role. The Hawks dabbled with Lue as the starter over Royal Ivey, but Lue just does not seem at ease anywhere but coming off the bench, and that was reflected in his numbers. Claxton definitely deserves a starting gig. He proved he could handle the job two years ago, scoring 13.1 points with over six assists per game in 44 starts with the Warriors before getting dealt to the Hornets. Definitely bump Claxton up your draft board this season. He should go somewhere early in the eighth round in a 12-team draft. Just a week after jerking around the Raptors, swingman John Salmons has landed in Sacramento in a deal expected to end Bonzi Wells’ stay with the Kings. Salmons, coming off a career season with the Sixers, agreed to a five-year, $25.5-million deal. He set personal bests with 82 games, 7.5 PPG, 2.7 RPG and 2.7 APG this past year, his fourth with Philadelphia. The Kings had been trying to re-sign Wells, who had an injury-riddled season, but was an absolute monster in a six-game first round loss against the Spurs, averaging 12 rebounds and over 23 points per game. Sacramento knows that Salmons can’t bring that kind of production to the club, but the team believes he can help in other ways. And after Wells’ spurned the Kings’ five-year, $36-million offer, it became clear that he had priced himself out of their range. Sacramento is over the cap, but used its mid-level exception to sign Salmons. The club is holding out hopes that it can pull off a sign-and-trade deal with Wells so they can get something in return. Could this be the breakout season for Portland’s Martell Webster? The swingman was taken sixth overall in last season’s draft, and managed almost 11 points, with 3.4 rebounds and 0.6 assists in the D-League. He appeared in 61 games with the Blazers, scoring 6.6 points with 2.1 rebounds, 0.3 steals and 0.6 assists in 17.4 minutes per game. Although his shooting (39.9 per cent) left something to be desired, Webster did sink 66 three-balls and was excellent (85.9 per cent) from the charity stripe. Webster was inconsistent in Summer League play, scoring 29 points one game, but shooting just 1-for-11 in another. Reports, however, indicated that he was emerging as a leader. That’s a good thing because even though he’s just 19, Webster will be asked to lead a Portland renaissance with the likes of Brandon Roy and LaMarcus Aldridge in the hopes that the team can finally shake its Jail Blazers rep. Expect Webster to go around the eighth round this year. NEXT: Three in the Key returns August 10, when we’ll update more of the offseason player movement and start thinking about the 2006-07 season. Baseball fans can check out Spikes Up every Monday during the season. It will appear next on July 31. This entry was posted on Thursday, July 27th, 2006 at 12:04 am	and is filed under BASKETBALL, RotoRob, Three in the Key. You can follow any responses to this entry through the RSS 2.0 feed. You can leave a response, or trackback from your own site.